This article focuses on discussing the approach of recovering deleted files free that are emptied from Recycle Bin or deleted by keys Shift and Delete, which is very useful and practical skill for those who don't have a habit of backing up files and face high risk of data loss. It takes clicking mouse once to save or delete a file, but saving files is assuring operation, file deletion might make trouble, especially when important file is deleted by mistake. It is learned that many users don't know the exact solution to recover deleted files free. In fact, we common computer users can easily recover deleted files free on our own provided that we use correct undelete software and perform proper functions. 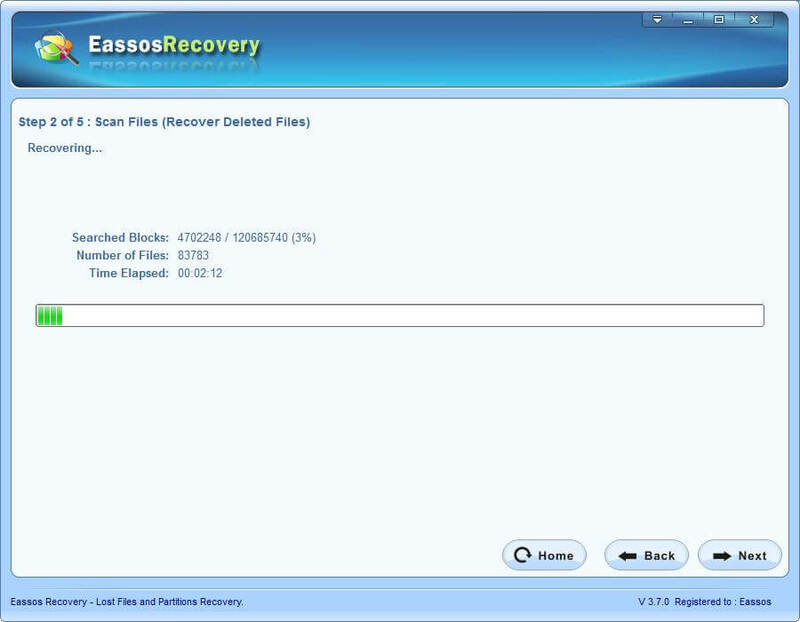 Eassos Recovery is effective and easy-to-use data recovery software that is capable of performing file recovery and partition recovery; more specifically, it enables you to recover deleted files from Recycle Bin as well as recover deleted files from USB flash drive, SD card, external hard drive, virtual disk, etc. Eassos Recovery can recover deleted pictures, recover deleted Documents files, recover audio files, recover video files, and other deleted file types under Windows Windows Server 2003, 2008, 2012, XP, Vista, Windows 7, or Windows 8. 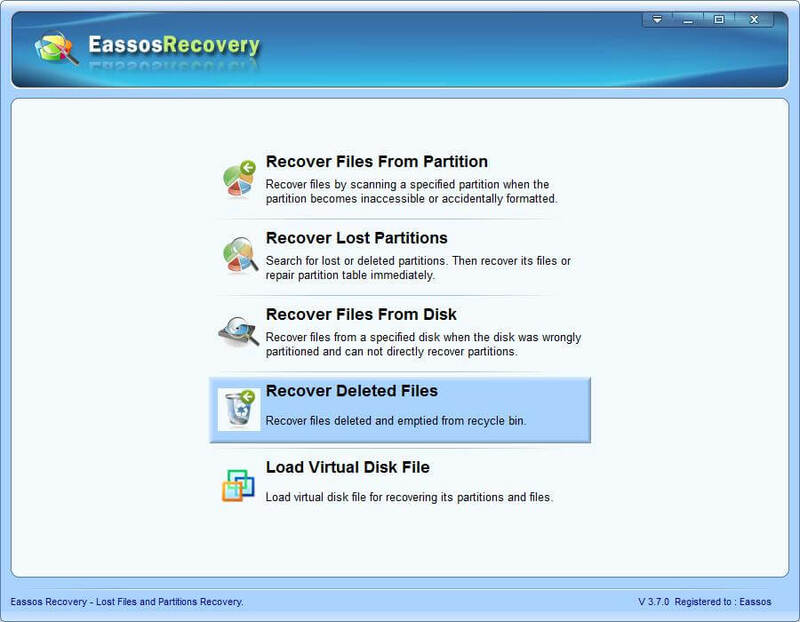 Why Eassos Recovery can recover deleted files? We need to understand how file deletion happens so as to maximize the chance of recovering deleted files successfully. Operating system keeps track of files by dint of "Pointers". Each file has a pointer which informs operating system of where the file's data is stored, file name, size, etc. When we delete a file from Windows Explorer, the file will be put in to Recycle Bin, but the file is still located on the hard drive even after Recycle Bin is emptied. Because operating system just deletes the pointer and marks the sectors that store the file's data as free space so that new files can be saved there. When the pointer is removed, the file is no longer visible, and yet it is still recoverable before it is totally overwritten. Therefore, it is strongly advised to stop using the computer if an important file is deleted as soon as possible and use Eassos Recovery to recover deleted files immediately. Eassos Recovery employs world-leading algorithm that is able to scan files in a further and deeper level so that it can locate and recover deleted files accurately and rapidly. 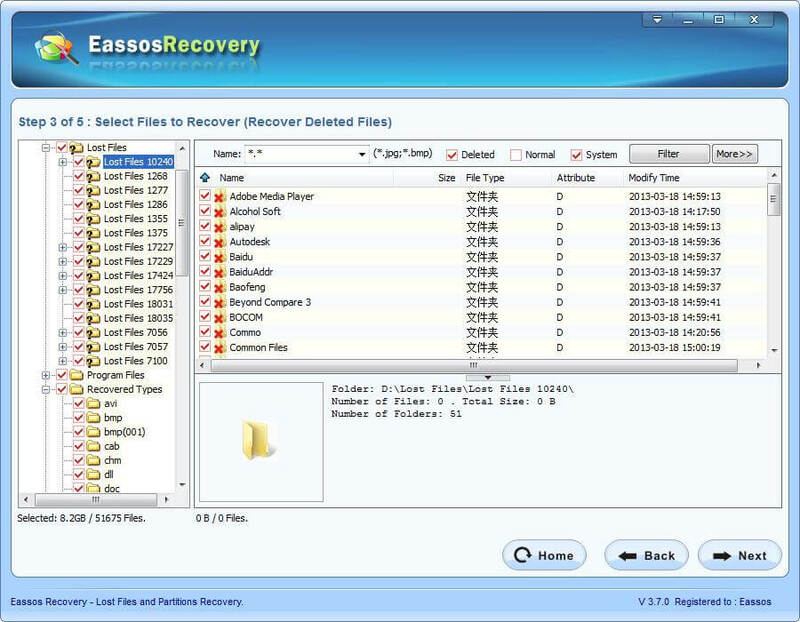 Compared with tradition data recovery software, Eassos Recovery is equipped with the function of recovering deleted files by file type which increases the possibility of successfully recovering deleted files that are partially overwritten or damaged. What's more, Eassos Recovery protects deleted files from being damaged via adopting read-only pattern for data searching which avoids any writing action. 1. Download Eassos Recovery, install and launch it. Select the button "Recover Deleted Files" on the main interface. 2. Select the drive that needs recovering deleted files and click the "Next" button to search for files. 3. 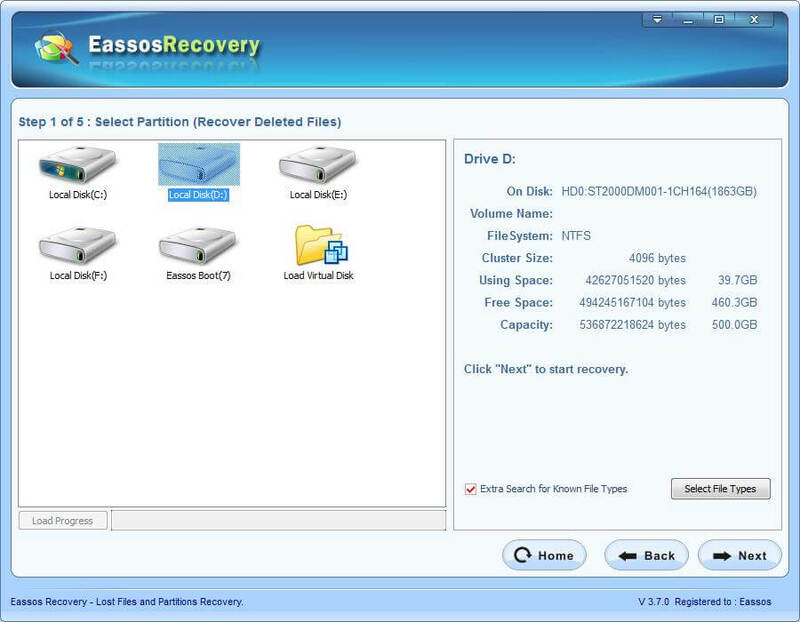 Eassos Recovery starts to search for deleted files from the selected partition, and this process may take some time depending on the partition size. Note: If you are not satisfied with files in folders "Lost Files", then view files in the folder "Recovered Types" where files are classified by file type. 5. Select files you want to recover and click "Next" button to save files to safe place. Do NOT save files to the partition or drive that needs recovering files, otherwise lost files might be overwritten!